After a long day’s drive from Thimphu to Punakha and checking out the interesting Chimi Lhakhang – village of phalluses painting, we arrived at the quiet Meri Puensum Resort on a hilltop. Due to its location (on a hilltop), we got a great view of the Punakha Valley – a welcome and calming view after a long day out. 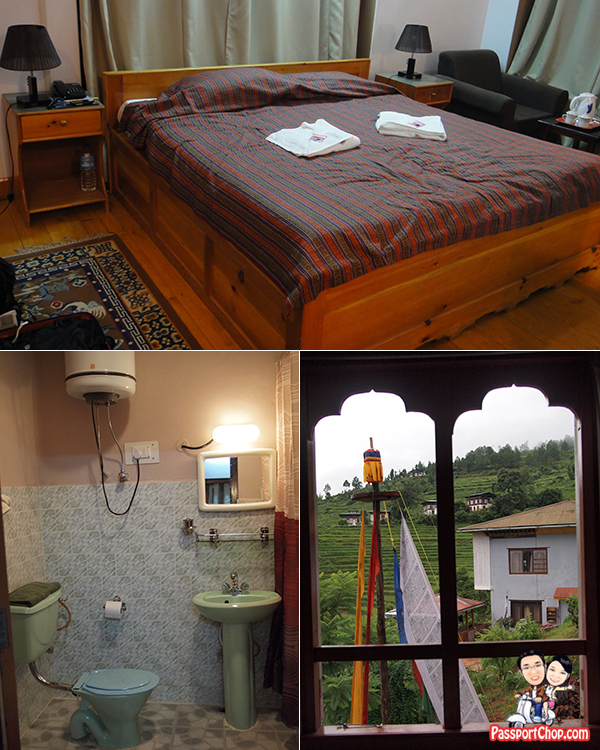 The resort’s design is also very beautiful with colorful tiles interspersed with traditional Bhutanese architecture. 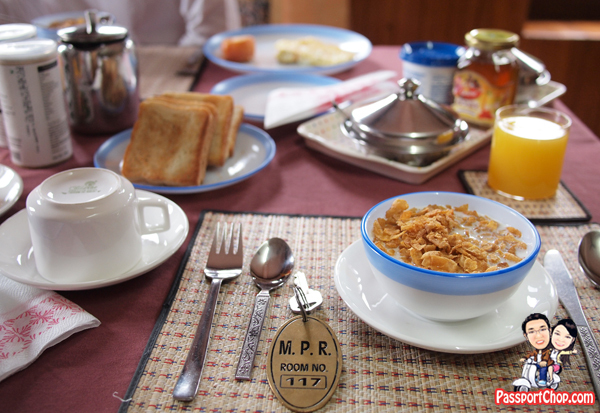 We were also the only guests during our stay at Meri Puensum Resort – one of the perks of travelling off-season in Bhutan. So there you have it – great views of the Punakha Valley, quiet and tranquil location and beautiful resort design and architecture – plus points for the Meri Puensum Resort. The room is generally clean and tidy. The room interior is quite dated with creaking wooden floors and a TV that didn’t quite work (no reception). Water pressure at the shower is also quite low but the bathroom amenities are simple and adequate. We got a bath towel each with a small bar of soap and a small pack of shampoo (those that you will typically find as samples in Singapore – these soap and shampoo are quite standard issue for hotels/resorts with basic amenities). If you don’t expect or need 5-star resort-type amenities and just want a quiet getaway/retreat from all the buzz in the cities and other trappings of large resorts (this is definitely not Uma Paro-type), Meri Puensum Resort is good for you. In fact, we loved to wake up to the sight of rice padi and quaint little village near the resort, admiring the greenery and taking in the fresh air here! We even did some yoga here – the Meri Puensum Resort is indeed perfect for yoga activities – being very quiet. This is an interesting place to visit. What an amazing views! oh I love your post. 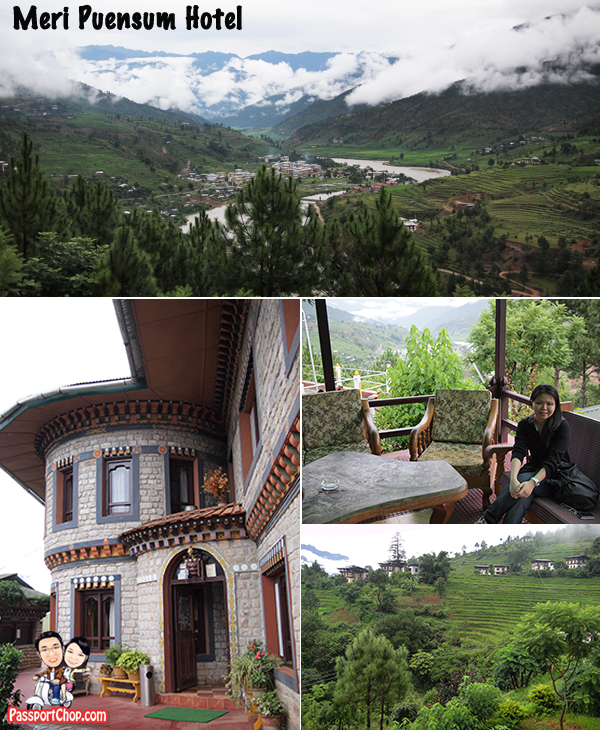 I’ve been searching for a good place to stay in Punakha. Thank you.